Contemporary charcoal for a man on the move. 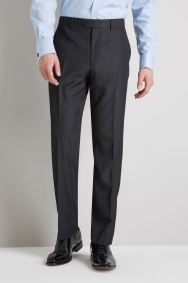 Make a solid addition to your suiting line-up with this plain weave charcoal suit from Moss Esq. 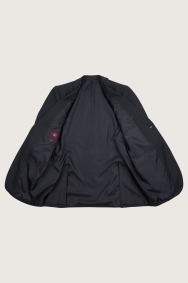 A great alternative to black and navy, the design of the single-breasted jacket is simple and effective with its notch lapel, side vents and two-button fastening. 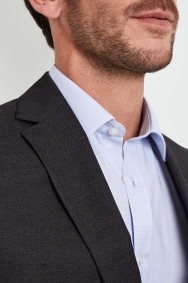 It’s also expertly cut across the shoulders and chest to offer a generous, regular fit. Pair the jacket and matching trousers with an open-necked shirt for relaxed office look. Wedding coming up? Rely on a bold tie and a patterned silk square to make a statement. The items that I bought were of good quality and were of good value. Awesome price and good quality. Great quality but only available in Regular and not in Small so will either have to get it altered or return. Just what was required, good style and fit. Smart jacket, would suit many occasions. Sizing excellent. Good quality, nice price, well known firm. Fitting of jacket is great. Looks very good. Good fitting light weight suit. The staff were amazing and the service was excellent. Following adjustments the suit is a perfect fit. Very nice every day suit. good quality product. As advertised. Nice quality. Very good fit. Looks expensive. The hole suit is looking amazing !! An excellent cut, good fit, feels comfortable. No issues, looks and feels great. Excellent choice very pleased with my purchase. Excellent product bundle, superb value. The description was spot on. Well impressed. Lovely fit and good quality. Best fitting jacket i've purchased. As with rest of suit, fitted great and looked good. The suit looks smart and of good quality. My husband thought the suit fitted very well. Good quality garments and perfect for my work. Excellent quality item, the feel is great and the fit is perfect for me. Perfectly tailored and well fitting suit. The perfect colour suit for every occasion. Would recommend it to anyone wanting to look perfect for the occasion. The full suit is great and fits fantastic we would recommend to others and already have at a family wedding we attended at the weekend. Very good product, good value . Good quality and excellent value suit. Nice jacket and good fit, regular fit and long length perfect for me. Being able to chose such a range of sizes was superb. But on the long side for a 'short' length but very nice - and I feel good wearing it. Very comfortable, sleek and fitted exaclty as I had hoped, the size guides and many variations on choosing your suit were a simple yet great service. Good fit and quality, would buy again. I'm 6'4 and the suits in Large sizes fit me without any issues. They're a better fit than suits I've had from other high street brands. Smart and stylish. Quality is good. Unable to use; jacket of a suit only; trousers still awaited. Very happy with the construction of the suit. Unfortunately the fit wasn't right for me. It looked like a £10 jacket from Asda. Don't bother!! Excellent fit, really pleased normally have difficulty getting something to fit. 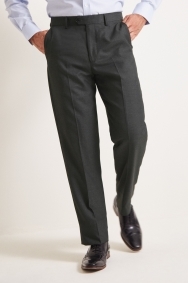 Good quality suit at a very reasonable price. Perfect fitting (for me anyway) and the mix and match allows you to purchase an extra pair of trousers at the size you want. Nice looking jacket overall and great for work. Smart, decent quality and inexpensive. To get a jacket to fit my tummy, the shoulders usually hang. The dimensions of this one are spot on - no sagging. I have looked at this item and thought very good value. Nice suit good quality and fit. Beautiful, well made jacket at a bargain price. Generously cut through the shoulder. the suit i bought was reasonably priced and the qualityexcellent my partner is really happy with it. excellent VALUE I THINK. sHIRT HAS BEEN WORN BUT NOT THE SUIT YET. Suit fits perfectly. Lovely cut. Very happy with it. Lovely fit and good feedback comments about my appearance! Not sure on product codes but everything purchased was excellent quality and price. Good value for money suit. 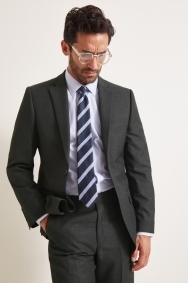 Very well made, smart suit..great to be able to choose sizes in items separately. Excellent fit and looks good for work. Very good value, smart inexpensive suit. Great value and suit complimented on. Very good fit and good quality material, very pleased. Good fit, arms slightly long. Sizes are unique to moss bros. Same size from other retailer is a bit smaller.